Chinese egg drop soup is one of the easiest soups to cook. I can’t seem to get enough of them. This shrimp egg drop soup recipe is so tasty and easy to cook. Perfect for busy days and busy individuals. My kids are having a one-week school holiday break right now. Usually when they’re at home, they love to bug me in the kitchen so I get them to help out with some simple cooking such as this soup. “Would you like an egg drop soup with chicken or prawns”, I asked Piggy. “Prawns”, she said. So prawns it is! I would prefer to chop up the prawns into smaller pieces as they were quite large. I kept them whole only for aesthetic purposes. Besides prawns, you can also use crab meat, chicken (which is very commonly paired with corn) or tofu. Even with just eggs and a soup stock, you’ll be able to make the simplest egg drop soup. If you want more flavor in the soup, add some ginger and spring onions when boiling the soup stock. I love eating corn no matter how it is cooked. It is cheap, delicious and available all year round. 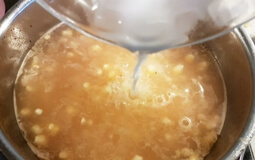 I usually use it to boil soups such as this Chinese sweet corn soup (cooked in a thermal cooker) and Chinese sweet corn soup with chicken and dried scallops. Sometimes I’ll just steam and slather the corn with butter and salt. 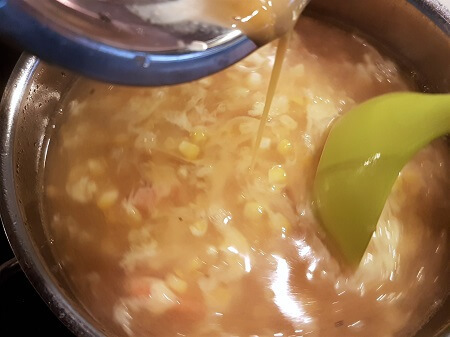 For best results, I recommend using fresh corn kernels for this egg drop soup. 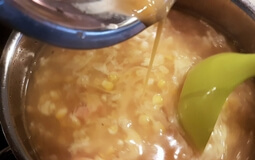 Don’t use creamed corn as it would make the soup overly sweet. Also, canned corn lack the ‘crunch’ of fresh corn kernels. Small flowers or big flowers? Do you like large or small egg flowers in your egg drop soup? To make large flowers, wait for a few seconds after you stream/swirl the eggs into the soup. Then stir gently with a fork or chopsticks. For smaller flowers, stream in the eggs with one hand and stir rapidly in one direction with your other hand as you pour. As the soup is already hot, turn off the heat before making the egg flowers. Don’t worry about undercooking the eggs. 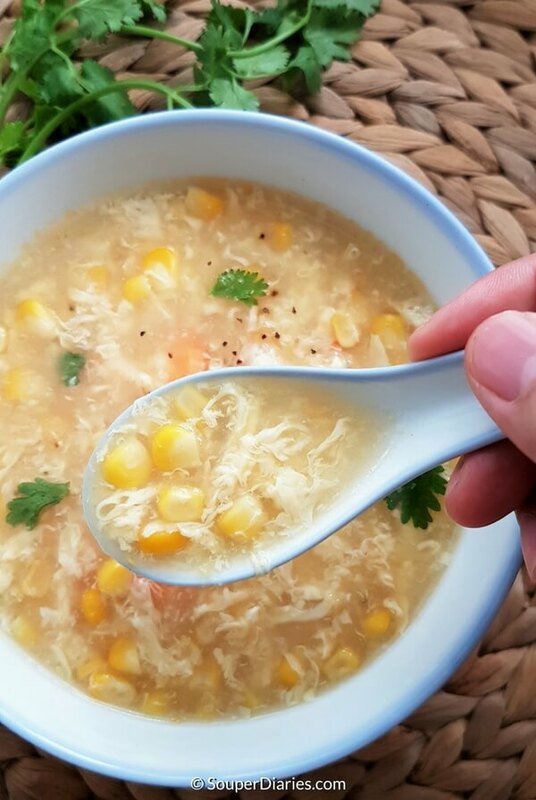 This egg drop soup has a natural sweetness due to the sweet corn. Try this recipe and let me know what you think. Check out my other quick soup recipes too. See you again and happy cooking! 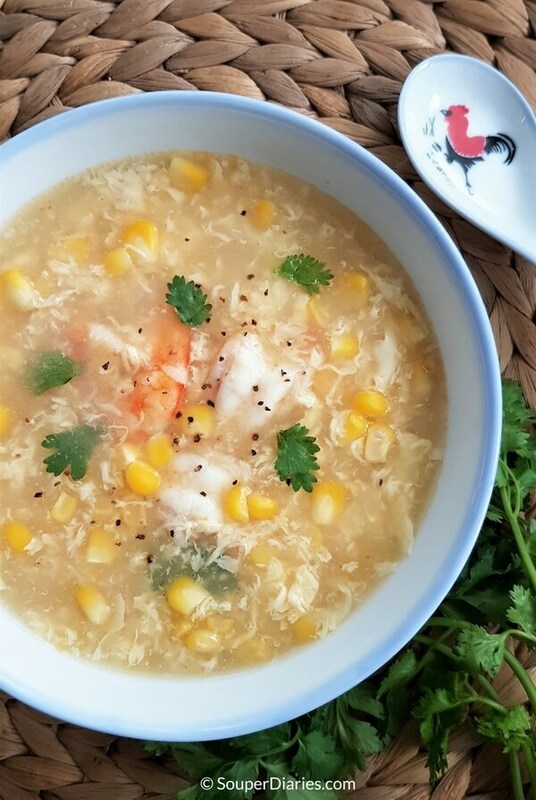 Egg drop soup with fresh corn kernels and topped with fresh prawns. Naturally sweet and perfect as an appetizer or a light meal. Shell and devein prawns. Rinse, pat dry and set aside. Lightly season with a little salt and black pepper. Heat oil in a soup pot till hot. Fry the prawns till just cooked. Do not overcook or the prawns will be tough. Remove and set aside. 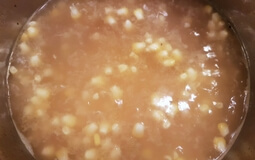 Add chicken stock, water and corn kernels into the same pot. Bring to a boil and then simmer for about a minute. This is to let the corn kernels soften a little. Add corn starch slurry. You may have to re-stir the corn starch slurry if it has separated. Mix well with the soup. Turn off heat. Slowly pour the beaten eggs with one hand and stir the soup with your other hand as you pour. Stir more frequently for smaller egg strands or stir gently if you prefer larger egg strands. Pour into individual bowls. Portion the prawns and add into the soup. Garnish with coriander leaves. Optional: Sprinkle with some ground black pepper. Serve immediately. This is my favorite soup to make! It is way too easy and so comforting! I love the tomato and egg drop. But anything with an egg drop, I will devour it easily. LOL. You always provide easy and tasty recipes, Yvonne! I will blame you for my weight gain! Hahahaha! Well, I hope you won’t put on too much weight, Arief. Haha! I love the images on all the recipes on your website. They all look so elegant, sophisticated, and delicious. Will definitely need to give the chinese egg drop soup a try. I just need to find more time in the kitchen. Thanks for providing us with very clear and easy to understand instructions! How delicious! My hubby would love to taste it. I am going to make it today. He is kind of diet love person. He will definitely like one. Please share more recepies which have dietary fiber in it. This looks delicious, but I’m a vegetarian! 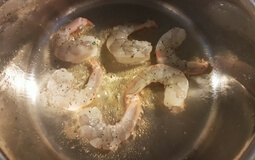 What can I use instead of prawns? You can add tofu, fresh shiitake mushrooms, asparagus or fresh bamboo shoots. Also, change the soup stock to a vegetable based stock.